Responsible for B2B sales growth? You're a wildcatter now...with data! But his article on energy technology this week got me thinking about it from another perspective relative to US manufacturing growth - as he detailed enormous technical advances in locating deposits and extracting the oil and gas (walking rigs, jewells, smart drill bits) it evoked thoughts of the tools now available to help companies find buyers. Then he went on to detail the asset value of the data held by today's oil speculators. That's the same potential situation that many OEMs could find themselves in with data generated from their B2B sales growth efforts. Of course OEMs have updated how they sell. They use email now! But while they add sophisticated 3D design software on the engineering side, do they still use clunky CRM systems? (ACT anyone? or even Excel??) While they employ laser cutting systems, do they still rely on manual data entry of leads? Does the robotic welder have an analog in marketing automation there? Or does the lean methodology apply to how they manage partner leads? The answer is almost invariably "No." Margin compression and competition are nonsense! Just as the whiskey guzzling, divining rod toting wildcatter of yesteryear is an antiquated stereotype, so is the back slapping sales person. But even the exploration techniques of a decade ago, and their B2B sales growth equivalent of activity targets for cold call and quotes issued, are outdated. But they are still used by many....who appear to be standing still as companies with more insight adopt new tools and adapt approaches accordingly. Manufacturers can persist in doing it the old way - using the approaches, technology and techniques that were effective in the 00s. And they still work - that's the hardest part of this whole discussion. Just as a classic drilling rig will eventually strike oil, traditional B2B sales growth techniques will eventually snag a customer. But the margin will be poor, the cycle will be extended and the predictability of forecasting will be laughable. In the end it's a matter of efficiency because neither approach runs full speed smack into a wall of failure. They just fail gradually, and most industrial manufacturing companies don't quite see it coming. Globalization and manufacturing efficiency are going to create a $45/barrel situation for your manufacturing business too. Will you be able to profit? Thrive? Of course buying an intelligent drill bit and carrying it out into the sage brush in the back of a dusty Suburban doesn't increase efficiency. And accumulating reams of data in and of itself is simply a data warehousing challenge. The instinct of oil men, geologists and scientists are now just part of the secret sauce - they are complemented by the rigorous analysis of data scientists. Neither succeeds without the other. The same is true of the new revenue growth model which is replacing traditional marketing and B2B sales growth approaches. CEOs can't simply delegate to the digital native in the office (it's not the tools alone that matter) nor does the "marketing manager" typically have the accumulated years of instinct and experience. They're really similar situations. In one case the goal is to pull oil out of the ground - drilling technology is the key to doing that efficiently. In your case selling projects so you can bend steel is the goal - sales and marketing are the tools, along with lean manufacturing, to do that. It's tragic to see solid companies slowly wither - especially when they're so close. They realize they need to change, take a couple of the obvious steps, but never really execute. You'd better optimize to thrive! How many dry holes will you persist in punching into the ground!!?? Want to dig into one possible solution to your challenge? 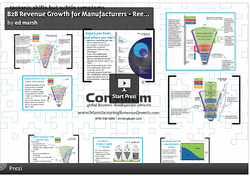 Start here with this eBook - Manufacturing Revenue Growth.